Situated just outside of Penrith in North Cumbria is the now derelict castle at Lowther. The 120 acre, Grade II listed site contains the remnants of at least three significant buildings and much of its 17th century gardens remains intact, although very overgrown and neglected. The grounds were once opened to visitors in 1938 but after being used to test a secret tank weapon during the Second World War, the area has become a relic of its former glory. The Castle and its Gardens have been closed for 70 years and now stand inaccessible and buried in vegetation. The Trustees of the Lowther Castle and Gardens Trust plan to transform the imposing remains of the Gothic Castle, its massive stables and over 20 hidden gardens into a destination that will return some of the grandeur and pride to the fallen Cumbrian gem. The history of the site, its occupants and the notable names that have worked at Lowther is minutely recorded in an archive of over 2,700 steel trunks. 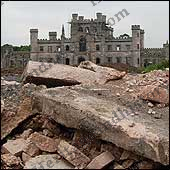 The Castle ruin will be stabilised but it will not be re-built. The ruin will tell the story of the houses that have occupied the site, the surrounding landscape and the stories of the people who have lived and worked at Lowther. The record of the 130 acre gardens is extensive. The layout dates from the 17th Century but the present gardens are Edwardian and all lie buried under spruce and sycamore planted in the 1960’s. There are over 20 different gardens at Lowther including a Japanese Garden, a Scented Garden, and an Iris Garden. Some gardens will be restored but visitors will also be able to see the remains of the Edwardian structures, lying derelict, covered in moss and lichen. An Energy Centre will power the 130 acre site using woodchip fuel derived from the management woodlands on the Lowther Estate. The Energy Centre will house a viewing gallery and education space. The £15m project will be carbon neutral and will be implemented over four years. The first phase is planned to open to visitors in Summer 2009.